Separation anxiety is part of a child's development, though some kids through it more intensely than others. But it's always rough on parents--it's hard enough leaving your child with somebody else, but listening to your baby melt down as you walk away? Uhg. We've gathered some expert advice to help you both through those hard moments. Whenever you can, let your child set the pace. It's a normal and healthy development for your child to experience separation anxiety—according to Elizabeth Pantley, a baby's separation anxiety tends to peak sometime between 7 and 18 months. Remember, she's only worried you won't be back because she loves you so much. Take the time to reassure her that your leaving is only temporary and that you'll be back soon. Talk about all of the fun and exciting things he's going to get to do while you're away. If he's staying with friends or family, talk about how much they love him and how excited they are to spend time with him. For daycare and school, talk about all of the wonderful friends he'll make and the fun things he will do. And don't forget to be as animated and happy as you can whenever he separates easily. Positive reinforcement is a great way to encourage your child to know he's safe and making good choices. Practice being away from your baby for short periods of time throughout the days ahead of the separation. Often just closing a door between you and baby is enough to trigger separation anxiety, so practice closing and opening a door like a big game of peek-a-boo. Babies don't learn object permanence until between 4 and 7 months, so it's hard for them to understand you'll be back soon. Leave the door shut for longer periods and praise her when she doesn't get upset. If you can, stop by anyplace you'll be leaving your child the day before and practice there as well. Just going into a different room for a few minutes and then coming back will help her learn you're not going to be gone forever. Social stories are great for helping your child to understand how a scenario is going to play out. A quick social story could include a picture of you and your baby together, a picture of each of you alone, followed by another picture of you together. The narrative can be as simple as, "Mommy and I are happy when we are together. Sometimes we are away from each other, but I am still safe because I know Mommy will be back soon. Look! Mommy is back!" If you want, you can include a picture of the person your child will be with while you're away to help him put it all together. When you're dropping your baby off somewhere, be calm and confident. It's understandable that you're going to feel some anxiety about your child's potential meltdown, but remember that your child is going to pick these feelings up, too. If you're able to exude a sense of calm it will help your little one understand that everything is alright and there's nothing to worry about. It can be tempting to scold your child when she's throwing a fit, but it's only going to make the situation worse for her. Try to keep in mind that separation anxiety comes from her fear that you're not coming back; she's terrified that you're going away forever so yelling or shaming her will only make her feel less secure. Hug her, give her a kiss, tell her you love her and will be back soon. It can be irritating dealing with separation anxiety, but a little bit of understanding can help her pass through this phase more easily. Once your child is old enough to follow simple instructions, teach him to take a deep breath when he is upset. You'll have to practice at home when you're both calm and comfortable, but it's a great technique to help him get centered when he's upset. Before you leave the house start coaching him to take a few deep breaths, then repeat before you get out of the car, when you get to the door, and again as you're leaving. It might take a few tries for him to get it, but even a small amount of deep breathing can help him to relax. Using art to help your child process his feelings is easy. Use whichever medium your little guy likes, and ask him to draw or paint how he feels when you're together. Then ask him to paint how he feels when you leave. Talk about the differences between the two and support him by telling him it's okay to feel sad or scared when you have to go away. Make sure you do your own drawings so that he knows you miss him just as much as he misses you when you're apart. The Audrey Penn book The Kissing Hand is about a little raccoon who doesn't want to go to school because he'll miss his mommy. Momma Raccoon sweetly kisses his hand and tells him the kiss will be there whenever he's sad or scared at school. Reading this story to your child and giving her a "kissing hand" before you leave can help her to be brave like the little raccoon in this beloved book. We tend to tell kids in distress that they're ok, and move to quickly distract them from their big feelings. But some experts warn that this can heighten anxiety and lead to a decreased sense of connection and self-worth. So try validating before you skip to another move: "You're feeling so sad that mommy's leaving." She might cry harder at first, but you also may be amazed at how it helps defuse tension and create bonding in the long run. Take a deep breath and notice what feelings are stirring in your own body. It's difficult to avoid feeling like people are silently judging you and your child as he flails and screams. Ignore the voices in your head, breathe, let yourself feel calm, and accept that everyone with children has been there. As you allow yourself to relax you will help your unhappy fella to relax, too. 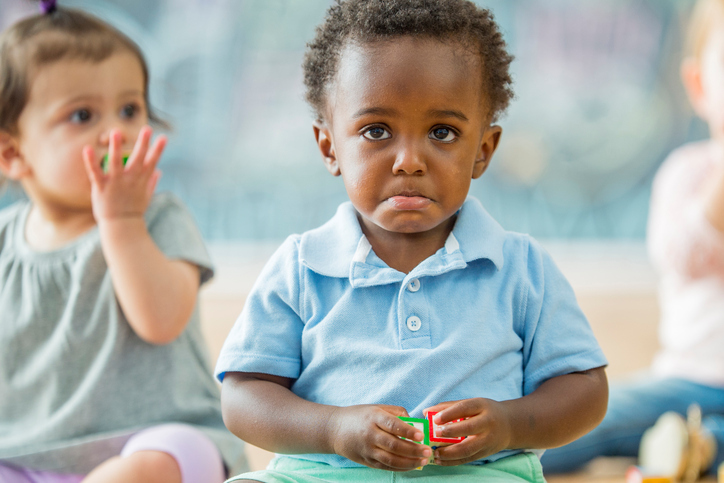 Separation anxiety can peak around 18 months, but often continues into the preschool years. Consistency, patience, and love are the keys to getting through the tough times when your child is screaming for you to stay. Stay firm and gentle during separation anxiety meltdowns—it's a difficult phase that many children deal with, but with clear guidance you'll soon be able to leave a happy and secure child whenever you go away.